Raised Roof Buildings are commonly used for residential and agricultural storage. They are attractive additions in almost every setting. With the center section raised to allow entry doors of 14 feet high, CSB's Raised Roof buildings are distintive, attactive, and functional. The raised portion of the buildings allow for easy storage of oversized vehicles. Alternatively, the raised portion may provide unique loft functionality. Typical sizes for Raised Roof buildings range from 1200 square feet to 5000 square feet. As distinctive as they are, our Raised Roof buildings include the industry standard setting features found in all Castle Steel Buildings. We raise the bar. 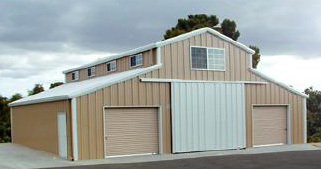 At Castle Steel Buildings, we raise the bar when it comes to steel building quality. All CSB buildings are made from the finest materials. We deliver the total package to specifications that include all of the trimmings. Beginning with an industrial strength frame consisting of I-beams and channels, we add heavy 26-gauge sheeting to form walls and roofs. All of our walls and roofs are painted. Super strong SMP (Silicon Modified Polymer) paint is available for tough-duty applications. And ALL the trimmings are painted in coordinated colors that provide a pleasing attractive and distinct finished building.